Four members of Caravana 43 came to Santa Cruz: two Normalistas — students who attend the Normal School — and two parents of kidnapped students. Photo by Jasper Lyons. Every day for the last six months, police officers and news outlets in Mexico have been telling Blanca Luz Nava Vélez that her son is dead and have told her different stories — he was shot, he was tortured and killed, he was burned alive. Despite the heart wrenching news, Vélez says she doesn’t believe he’s dead. She feels in her heart he is very much alive. Vélez told her story before a full house at the Resource Center for Nonviolence on Tuesday evening where a translator helped relay her thoughts to non-Spanish speakers. She is one of 14 people who volunteered to share her experience with others across the United States through Caravana 43, a project meant to spread awareness of kidnapping and the Mexican government’s corruption. UC Santa Cruz’s chapter of California Students for Ayotzinapa reached out to Caravana 43 and put Santa Cruz on the group’s list of stops. On Sept. 26, about 100 students from the Raul Isidro Burgos Normal School in Ayotzinapa, an all-male teacher training college in the southern Mexican state of Guerrero, entered the city of Iguala to protest education reforms and raise money to attend an upcoming demonstration in Mexico City. Iguala Mayor Jose Luis Abarca ordered police to detain the students, and municipal police and other armed men ambushed the three buses. Students dispersed and fled the scene. While dozens managed to escape, 43 students were thrown into police vehicles, and have not been seen since that night. Vélez’s son Jorge Alvarez Nava was one of those students. Four members of Caravana 43 came to Santa Cruz: two Normalistas — students who attend the Normal School — and two parents of kidnapped students. One of the Normalistas on the tour is Angel Neri De La Cruz Ayala, a 19-year-old second-year student. He said many students at his college are concerned with social justice issues and look at the Mexican government with a critical eye. To gain public support against the Normalistas, Ayala said, the government has lumped activists in the same category as drug lords. On the subject of what people in the U.S. can do to stop the corruption in Mexico, students of the UCSC Collective for Ayotzinapa discussed the Merida Initiative. Enacted in 2008, the initiative is “a partnership with the Government of Mexico to disrupt organized criminal groups, institutionalize reforms to sustain the rule of law and support for human rights, create a 21st century border structure, and build strong and resilient communities,” according to the US-Mexico Embassy website. Since 2008, the US has alloted $2.3 billion to the Mexican government through the Merida Initiative. The more actions Mexico takes to combat the initiative’s definition of crime, the more money it gets from the U.S. Fifteen percent of the aid is conditional upon Mexico meeting four human rights conditions: transparency and accountability in law enforcement, civilian trials for military officials accused of human rights violations, consultation with human rights groups, and prohibiting testimony obtained through torture. Martha Ortega, a member of the UCSC Collective and a fifth-year Latin America and Latino Studies major and education minor, said the U.S. is essentially funding Mexico’s unduly violent operations. Ortega and other members of the UCSC Collective for Ayotzinapa made a call to action, informing attendees that they are involved in the violence in Mexico whether they realize it or not, but that there are ways they can help put an end to it. 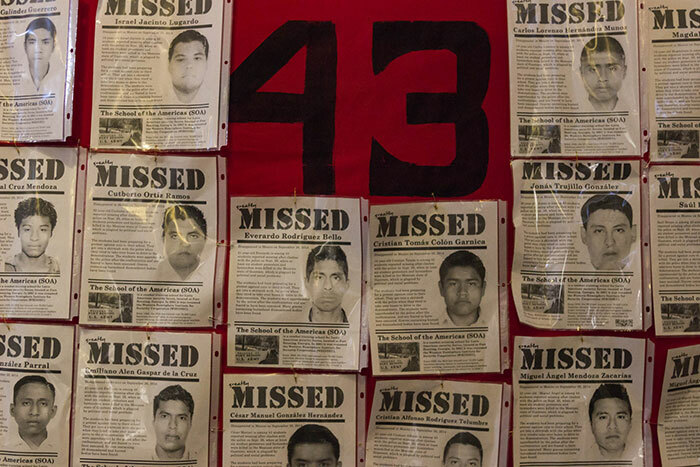 The four Caravana 43 speakers and members of the UCSC Collective for Ayotzinapa urged attendees to sign petitions and contact their local policymakers, but at the most basic level, they asked that people simply think critically about the world — even about things that they think do not directly affect them. Caravana 43 has three different caravans traveling throughout the US, one in each of the Pacific, Central, and Atlantic regions. The tour began March 15 and will end April 28 in New York.